Children's past life memories is a natural phenomenon. It happens all the time. Very young children-some as young as two-make spontaneous statements about a past life. The families are convinced the statements are genuine because the children reveal information they couldn't have possibly learned any other way. And they sometimes exhibit behaviors, such as phobias, that correspond exactly to the past life statements. Children's past life memories can be found in all parts of the world and in all cultures. Their appearance is not affected by the family's religious beliefs because many of these children are from families that do not believe in reincarnation. It can happen to any one. But most people don't see when it happens right under their noses because that don't know that children's past life memories are even possible and they don't know what to look for. If they do see it in their child, they worry that it's too weird, don't know how to respond to their child, and are afraid to mention it to anyone outside the family. Children's Past Lives is really two books in one: a memoir of Carol's discoveries after she witnessed past life memories in her own two children, and a guidebook for parents. In 2001 she published a follow-up book, Return from Heaven, which explores cases of children's past life memory in the same family. Chase Bowman at the age he had his first past life memories (described in the opening of Chapter 1). Children's Past Lives is packed with fascinating stories and cases—all different, all true. The first story is Carol's own, and tells how she accidentally discovered children's past life memories when her own two children had past life experiences and were cured of persistent phobias. But the book is more than just stories. Carol goes well beyond the simple fact that children spontaneously remember past lives. She draws lessons and patterns from the cases. Adding insights from past life therapists, research scientists, and ancient spiritual texts, she organizes what she has learned into the principles of children's past life memories. She outlines practical guidelines that parents and anybody who works closely with children can use to identify and respond to children's past life memories. To give you a sample of the richness and variety of Children's Past Lives, Carol has selected short excerpts from each chapter and put them here to ponder. They're listed in the Table of Contents below and in the menu to the right of each excerpt. Read the true fairy tale story of how Carol, a stay-at-home mother with no experience in publishing, met Ian Ballantine and got Children's Past Lives published. 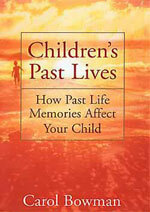 Here's a review of Children's Past Lives by Winafred Lucas in the American Board of Hypnotherapy Journal.